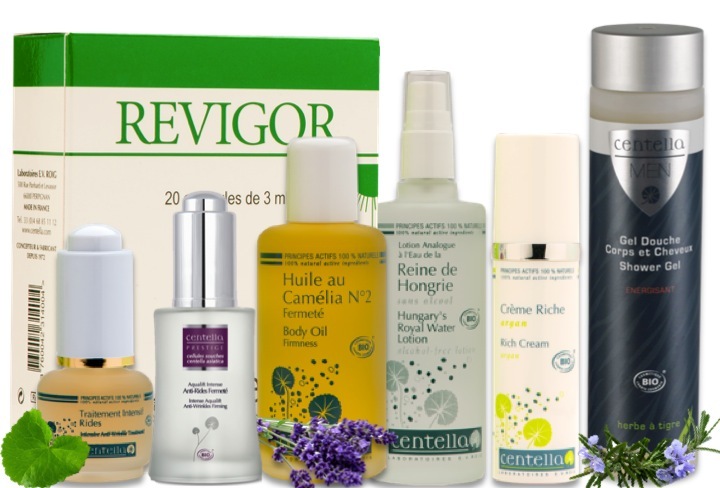 The Centella brand is a complete range of phyto-aromatic cosmetics face and body bound for the beauty professionals .With more than 45 years of expertise in institute care, Centella products combine aesthetic technical experience and cosmetic innovation for comprehensive and effective care. Centella is a range of cosmetic products made in France and certified organic by Ecocert and it respects the COSMEBIO charter. Centella beauty products combine the Centella Asiatica, a remarkable beauty active ingredient, with essential oils, real concentrates of plant active ingredients very popular in aromatherapy and cosmetics for their many properties (anti-aging, hydration, hygiene, slimming …). Centella offers a wide range of cosmetic products enriched each year with products at the forefront of phyto-aromatherapy research. Our protocols care are developed with the desire to bring real results on the skin of our customers from the first care in institute. This is why our formulas are mainly developed with high concentrations of natural and organic active ingredients demonstrating the effectiveness of nature’s treasures. We develop our products with the same desire, some of them are acclaimed from the first use by many customers. Thanks to this commitment in the design of innovative beauty treatments, efficient and respectful of Human and the Environment, our beauticians in France and abroad have been faithful to us for many years. All Centella products are associated with almost 20 new skin care protocols, face and body, developed by key experts such as Sophie Meyer, our beauty consultant and Corinne Wolf, best worker in France. Some products have even been developed exclusively for institute care in order to enhance the expertise of our beauticians (Alginate Mask, Aromapeeling, Optimum Moisturizing, Anti-comedones DF60, Heating Slimming Fluid ….). These skincare techniques are the subject of specific training conducted by our trainers during sales organized in France and abroad. Thanks to their “customized” character, all our care protocols are flexible according to your needs but also to your clients and their budgets. Since our creation, we have vocation to become the privileged partner of the beauticians in institute as at home, providing with all the necessary elements for the deployment of your activity: samples, testers, displays, communication panels, clothes, quantitative discounts, promotional plans , affiliate program … .. Choosing Centella is choosing a line of beauty products specially formulated to meet the requirements of all our beautician clients, whether at a beauty salon or at home.